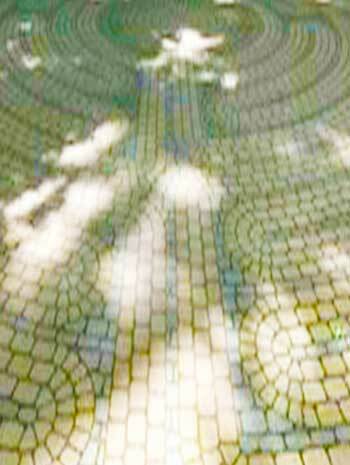 Play with your shadow’s appearance, move it around the labyrinth as you enjoy your experience it today. Love how big you can make it and the variety of things you can do with it. Reflect on the effects of walking with your shadow… what do your steps create? A fun way to walk the labyrinth, is to walk with your shadow. On this Ground Hog’s Day experience, walking in the early morning or afternoon can walk inside the shadow at some point and outside it at others. As the shadow can represent, larger perspectives than we might normally not see, or smaller ones of a different angles, experiment with where and when your shadow appears. In the spirit of love, play with your shadow and discover where it might represent the longer views of what you love to be, do or experience as you walk. 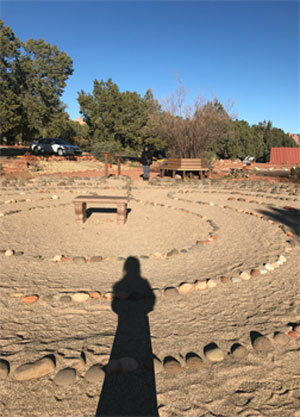 Imagine the Ground hog’s custom of seeing the shadow as an interpretation of where the love flows freely as if an enormous reflection on the labyrinth and where you might be in search of it should the absence be noted. 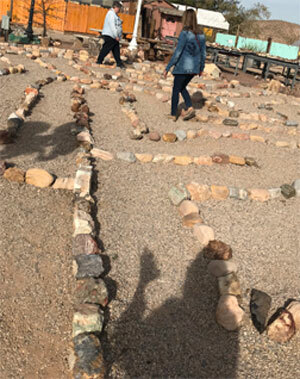 You can always position a labyrinth cut out overhead and let the sunlight project its shadow to finger walk, or if the shadow is large enough, you can physically walk it. A very different perspective. If we are going to collaborate, contribute and care in a mutually beneficial way, it reasons that a month of love tucked into our year would bring out what we love, why we love it, how we love it, when we do and where we might focus that energy. In this month the contributions you become aware of can be shared to walk in the steps of what calls our heart to action. As we walk toward walking the world with others, taking steps to realize our own relationship with love will assist us in how and what we are, what we offer and what we contribute. Explore steps of love in simple walks personally or professionally in the days of this magical month. Become aware of the things you love, the people and what becomes relative when love is the focus. Walk, design, teach, build, and share the love expressed in sharing an experience this month of current experiences or past that are related to the focus of love. This experience moves forward because of your sharing and caring, thank you! Do a love meditation with love as the focus before you begin your walk and after you complete it. Observe the ways in which you walk, notice, energize, and experience the affects. If we are to walk the world with others, a look at love is a worthy walk to begin the month. It deepens our capacity to expand and extend ourselves into the wide sea of possibilities where love is concerned. There is love of what we do, who we are and why we do it to consider outside of our love for one another. There is love of our environment, our world and those who contribute along with us to make it a healthier and happier habitation. The walk of the first of the month is always a great love in the magical qualities of the newness it creates. After a month of developing beginnings, the walk of love may be reflective and at the same time offer a direction the heart can happily follow. Light hearted steps become a way of the mornings experience. Curving and finding the outer edges of each path’s dimension. Somehow the uplifting of love energizes the center as if to step into the beating heart of the pulse of the world, all the while realizing the significance of the world’s pulse and my own. 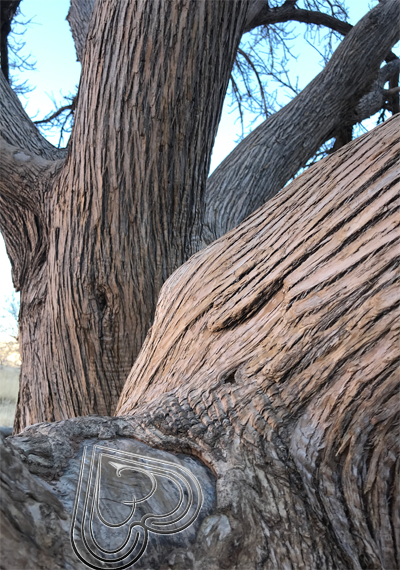 Walking over to the great tree on the path away from the labyrinth, a reminder that the heart of this tree was found last year in the center of its structure and this design was inspired to place in its heart shaped opening. It was an inspired discovery that inspired another discovery and today was a reflective remembrance that inspires a larger walk of love when shared with a visiting friend. 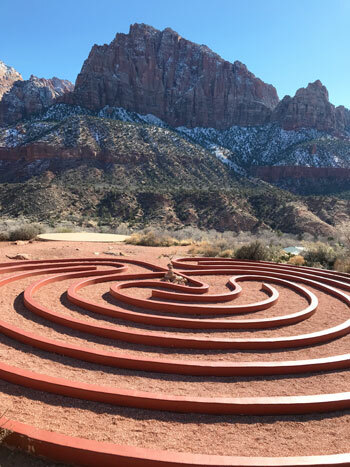 Consider the contributions, rituals, customs and blessings that have been a part of the walks before you as you step into your experience on the labyrinth today and the experiences in life you step into. Realize how many of those contributions you have been a part of, contributed to and how it has made a difference. Recalling a memorable moment, the Manager Reeves shared that visiting monks had contributed a blessing for the labyrinth. The Manager also shared of another contribution by Labyrinth Society’s Founding Member Taffy Lanser’s ceremonial tribute. 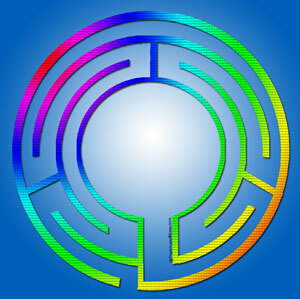 While this labyrinth is a contribution for so many, it is made up of a number of contributions. In time the labyrinth yields a harvest of ideas, walk with the time between your beginning and now to consider your own harvest. What did you yield from your experience? I have gained an awesome healing tool that has inspired me over the years in many ways. 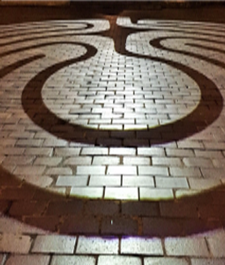 The labyrinth has become a go to place for me to release fears, practice patience and stay focused in the moment. It has brought me closer to myself spiritually and I have met many new people near and far because of a love for the labyrinth. Walk with your ancestors on a journey today. Whatever questions you may have, allow you to step into an experience with your roots and observe how they might answer your initial questions. Beyond the initial answers, what else did you walk away with in your walk of the ancestors? Experience yourself as an individual solo on the walk and at some point begin to regard yourself as one of humanity walking with others. Observe the different ways you regard the experience. Recently, my attention is turning toward the value of being someone who ‘holds’ others – often silently, praying for them or just being a gentle guide in the background. This is a developing ministry for me, (I am an interfaith minister), that is taking me away from my usual preference to be ‘up front’, and probably encouraging me to allow my ego to take less center stage in the process. 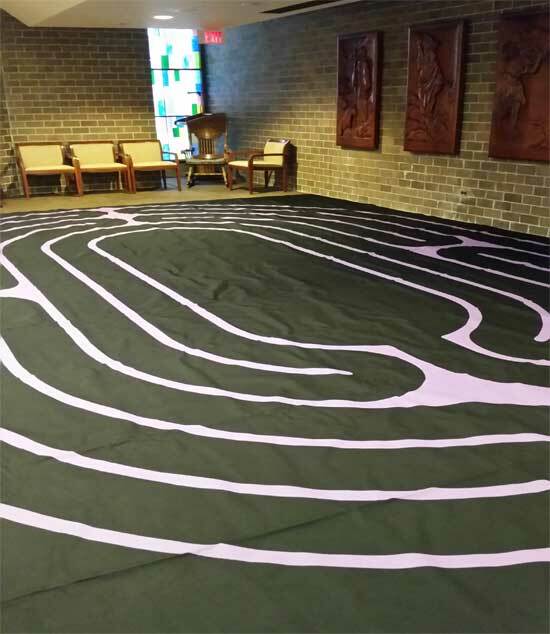 I’m increasingly aware that labyrinth walking is a shared experience in which each person experiences their own feelings, thoughts, etc, but at the same time is a part of a greater whole. 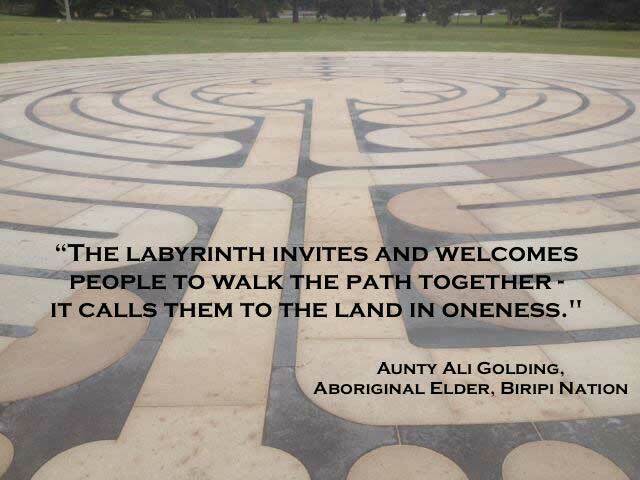 Everyone who walks the labyrinth is treated equally, and our egos seem to fade away when we allow ourselves to just walk. What is noticed, what is gained in the extra time? the more I have creative ideas centered around sewing projects, art projects, and especially writing projects that present solutions to issues my clients OR I face or new ways of reframing life, so I can move forward in life or business after being stuck. Close your eyes and imagine this walk in the seasons of your year. Walk in as winter. At the middle of the first half of your walk close your eyes again and imagine the spring. At the end of the first half repeat the imagination with summer and before the last quarter of the walk, imagine fall. Do you walk differently with the seasons? Which is the most engaging and which the least and why? 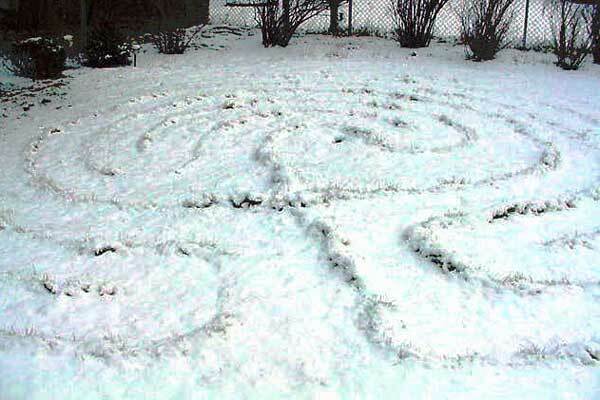 Walked the labyrinth today even tho snow covered 99% of path! Insight that as long as I kept moving, with muscle memory of having walked it before and knowledge of the center, even if it wasn’t a neat way to get there, I would still arrive at the center and retrace my steps back out again. Honest about some discomfort about not doing it “right” and appreciation for building consistency of engaging with the labyrinth/myself and getting good exercise and brisk fresh air, too! What if you had to create a labyrinth on the spot, what would you use, how would you design it and why a specific design? Walk your original design into the walk of today. Notice the elements you added to your experience, what did you walk away with? Having an opportunity to present a labyrinth on the fly to a group, the question that arose became about the materials to develop it with quickly. Finding what was available in a pile of cloth material, the path began to form as the idea for it’s design was imagined. Being able to tear it into lengths and tie them together formed a continuous strand. Once the length of material was connected, the path was laid out with ease in just a few minutes. The adjustment and alignment took an extra 10 minutes before the walk began. With questions from the group that had already been put into place before the group took a short break, the design came together in what seemed an effortless experience. Everything moved into place in the right way at the right time. What was interesting was how the process we used in creation to completion seemed to have been adopted in the discussion that followed quite naturally. Some times the labyrinth sets the tone and other times it just allows us to realize what we already know and organize it in a way that we can understand.